In this classic of the 1960s, Ken Kesey's hero is Randle Patrick McMurphy, a boisterous, brawling, fun-loving rebel who swaggers into the world of a mental hospital and takes over. A lusty, life-affirming fighter, McMurphy rallies the other patients around him by challenging the dictatorship of Nurse Ratched. He promotes gambling in the ward, smuggles in wine and women, and openly defies the rules at every turn. But this defiance, which starts as a sport, soon develops into a grim struggle, an all-out war between two relentless opponents: Nurse Ratched, back by the full power of authority, and McMurphy, who has only his own indomitable will. What happens when Nurse Ratched uses her ultimate weapon against McMurphy provides the story's shocking climax. Narrated by an Indian everyone believes to be deaf and stupid, we follow the acts of rebellion caused by the newcomer, McMurphy. Thanks to his charismatic nature, he introduces the patients to things they never thought possible. As you know, I’m a huge fan of psychology based novels and this is, by far, one of the greatest I’ve read! 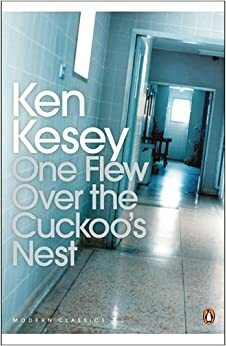 When Kesey was younger, he worked as a janitor in a mental hospital, which adds to the story line in making everything much more realistic. The plot is fantastic and incredibly well written. There are scenes of humorous rebellion and saddening consequences which provide an all rounded effect to the novel. The ending really surprised me however it was my favourite part, full of joy and sorrow. My favourite character had to be Bromden. He was adorable and brave and despite everyone’s view of him, he still managed to succeed. I also found McMurphy to be captivating, hilarious and full of spirit. As I was reading this, I really felt that he came alive in my imagination. Even Nurse Ratched was portrayed fantastically, with her controlling attitudes and strict hospital rules. Overall this is a really good read for anyone interested in mental health. The themes of differing status in gender running through were interesting and I found myself doing more research into it afterward. To be able to understand the real messages, you have to be committed in reading, however I would definitely recommend this as a must read novel!